Danny O’Connor is an artist based in Liverpool, he graduated from Liverpool John Moores Art School where he studied graphic arts. Danny is predominately a figurative and portrait artist who has a strong graphic element in his work. 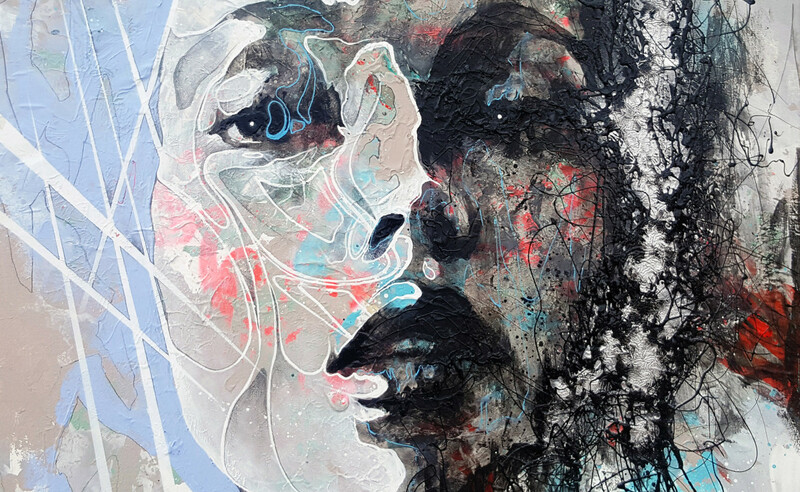 His expressive mixed media works incorporate; acrylics, spray paint, ink, paint markers and household gloss and emulsions. All applied in an equally diverse manner using brushes, fingers, paint rollers, sticks, paper and cardboard to create expressive and striking imagery. Danny is influenced by diverse sources including; comics, illustration, character design, tattoo art and cubism, futurism, art noveau, the pre-raphaelites, modernism and constructivism all pulled together to create hyper stylised and abstracted works. Danny combines natural flowing lines with harsh diagonals. Clean crisp areas of colour with layered messy splashes of paint to achieve something that appears both modern and almost futuristic whilst retaining a raw traditional aesthetic. The paintings are built up in layer upon layer of paint which give the pieces great depth of field. They are created with an arsenal of tools that don’t settle with convention. Danny will be exhibiting at Well Hung with Otto Schade on Thursday 25th May – 30th June.